The role of Director of Services is to manage and oversee the service account of various clients of the company. 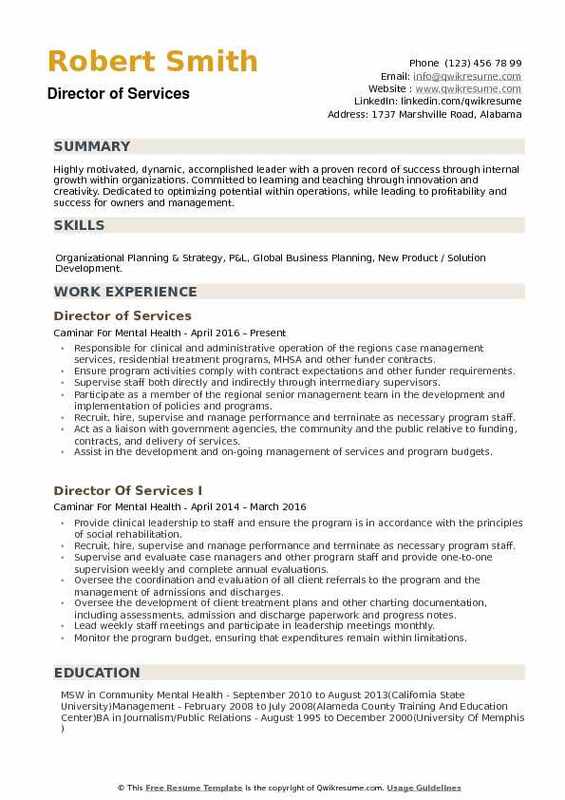 The essential duties listed in the Director of Services resume consist of – devising client service strategy, developing effective client relationship, maintaining retention rate, devising means to drive new clients, training and supervising client management team, tracking necessary feedback, communicating and resolving issues pertaining to difficult customers, detecting profitable business opportunities, developing client service strategies and intervening when any problem occurs. 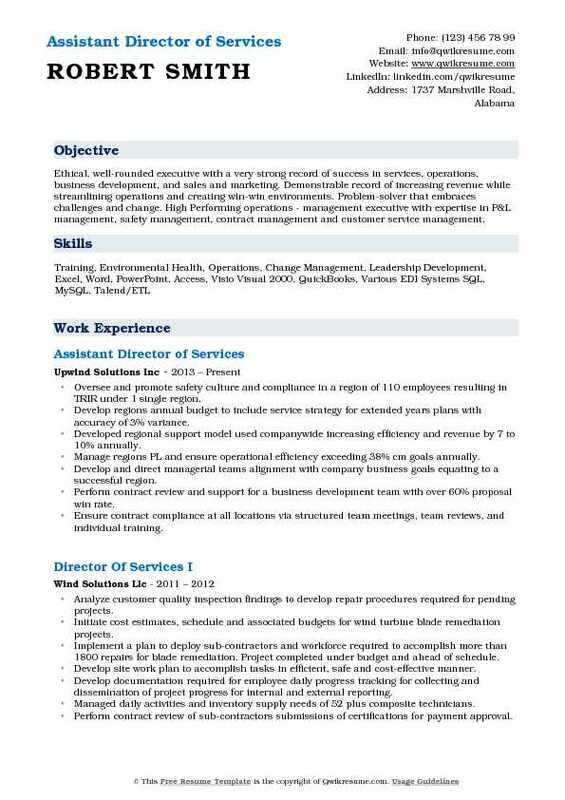 Headline : To secure a Director of Services position in a corporate setting which offers potential to contribute to the profitability and success of an organization requiring an individual with strong leadership and proven ability to change, and manage change, required in Today's competitive environment. 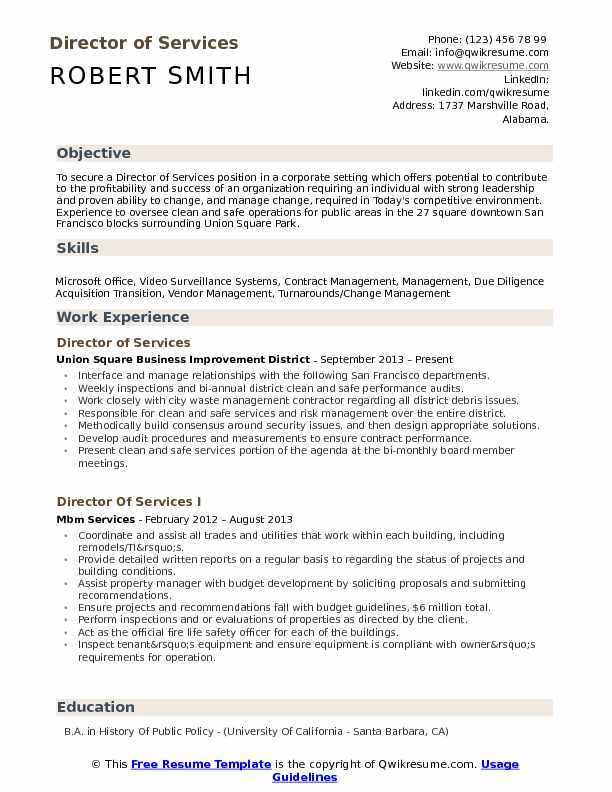 Experience to oversee clean and safe operations for public areas in the 27 square downtown San Francisco blocks surrounding Union Square Park. Interface and manage relationships with the following San Francisco departments. Weekly inspections and bi-annual district clean and safe performance audits. Work closely with city waste management contractor regarding all district debris issues. Responsible for clean and safe services and risk management over the entire district. Methodically build consensus around security issues, and then design appropriate solutions. Develop audit procedures and measurements to ensure contract performance. Present clean and safe services portion of the agenda at the bi-monthly board member meetings. Draft annual reports for both services and surveillance camera components. Field incoming service requests from outside sources and ensure completion from the vendor. Manage all vendors/contracts associated with services for the district. Headline : An accomplished manager with a strong Consulting and Client Service background in ERP systems. Experienced in the software implementation field, specializing in: Personnel management, project development, multi-project management, client management and process improvements. Proficient in anticipating problems and enacting preventive measures to track projects to scope and budget. A seasoned mentor and coach noted for sound business judgments and a can-do attitude. Responsible for oversight and growth initiatives of the entire service department and associated technical staff. Ensures prompt response to all customer and company initiated service issues. Monitor and add additional revenue through service contract sales, including equipment repair, preventative maintenance service charges etc. Ensure accurate, timely reporting of service billings through QuickBooks software package and working in coordination while working with the accounting department. Decide in coordination with the management, the pricing of service related charges through the service center. Maintain an effective control of expenses in line with agreed objectives by regular examination and review of management accounts and comparisons with budgets. Ensure accurate recording of parts and service times, job costing and invoicing in the service department and RMA process as required. Effectively monitor and meet monthly service budgets by actively soliciting new service clients and working in conjunction with sales staff to leverage existing client relationships for new service business. Responsible for direct supervision of all technical staff including service technicians. 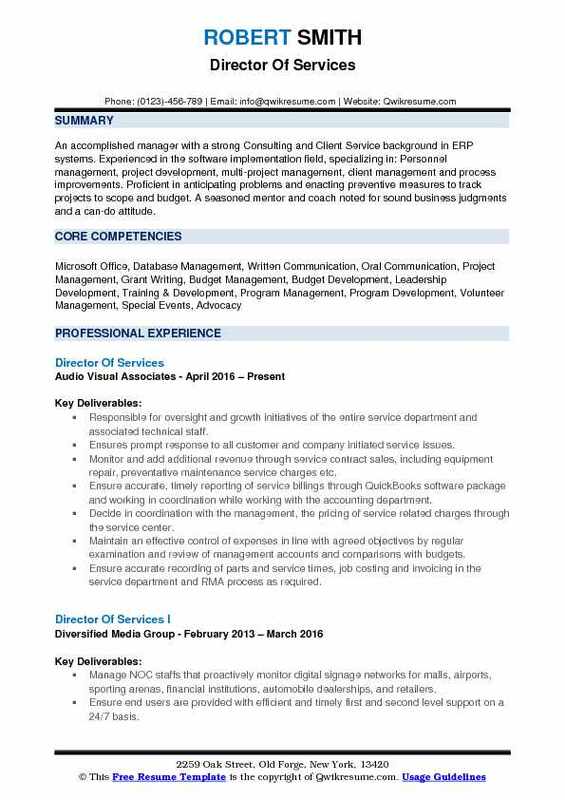 Headline : Dynamic detail-oriented professional with program and contract management skills. Strong analytical and problem solving with extensive knowledge of program implementation, staff supervision, motivational and continuous quality improvement. Expert in collaboration and partnership development. Skilled at identifying programming needs and implementing corrective measures. Ability to evaluate and motivate as well as develop improved systems. 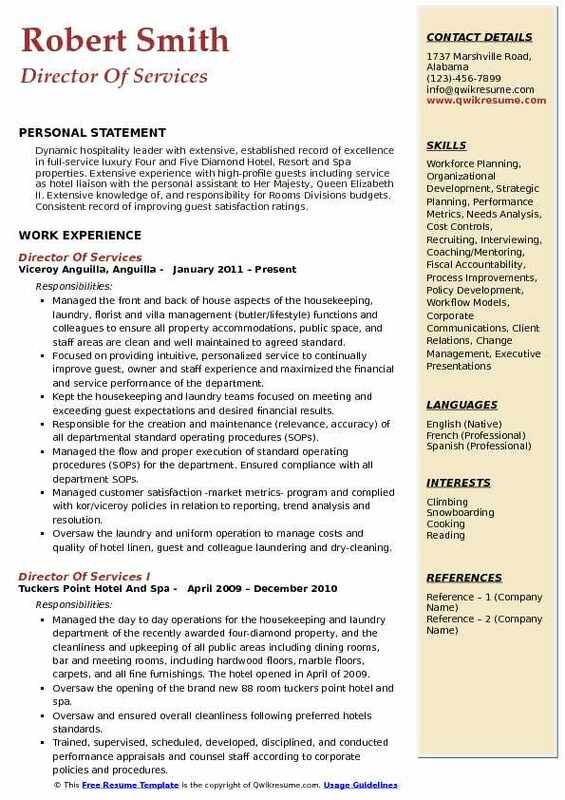 Experienced in employee relations and retention. Manage and administer contracts, including preparing and submitting reports to meet contract/funder requirements program effectiveness and opportunities for improvement. Ensure compliance with all funder, contract, and government regulatory requirements. Develop and implement data reports to monitor contracts and the use of resources. Implement a new five-year federal funded demonstration grant employment program for youth with significant disabilities. Provide leadership, management, professional development, supervision, coaching and performance management to thirteen direct services staff. Act as an advisor to programs and assist in the identification and procurement of resources. Design new staff onboarding procedures for a three-week training to acclimate to the culture of independent living and to learn the nuances while gaining skills, knowledge and resources to work autonomously. Purposefully shape the dialogue for collaborative engagement to advance accessibility efforts. Build partnerships among stakeholders including employers, universities, community-based. Summary : A results-driven, highly motivated professional with exceptional communication, relationship-building and networking skills with expertise in client relationship management, customer satisfaction, and retention, and people management. Core strengths include - Excellent Communicator - Relationship Builder - Effective Networker - Customer Retention - Highly Organized - Time Management - Strategic Planning - Complex Problem Solving - Team Building & Leadership. Network throughout the community to find appropriate resources and opportunities to enhance agency programs and enrich the lives of the clients. Promote the agency in the community or with other agencies, organizations, schools, etc. Provide support to families in the navigation of available services and supports, as well as community resources. Initiate, educate and develop community awareness by teaching courses at local schools. Develop and implement measurable outcomes for over 40 clients to help them to achieve life-enhancing goals. Strategize creative ways to ensure the clients are achieving regular progress in set outcomes and goals. Monitor progress at least monthly and communicate with responsible parties as needed to ensure goals and outcomes are current and met. Facilitate meetings as needed to discuss progression and to continue developing ongoing ways to ensure the client's success. Plan, organize and implement activities for program participants and their families. Summary : Accomplished builder and manager of Application Development/Integration and BI/DW consulting practices with a successful track record in selling new business. Proven ability to translate complex technical concepts into clear business case requirements for IT solutions. Passionate commitment to BI, Data Warehousing and ERP implementation best practices, usability, and customer satisfaction. Oversee MicroStrategy/sap business objects/Microsoft BI and Informatica ETL consulting activity, including services management, delivery, and strategy. Work with the executive leadership to set corporate policies and shape tactical actions on strategic initiatives, including the development of new cloud-based service offerings. Develop strategic account plans for existing accounts, including organizational overview, account goals, tactical activities, burn rate, pipeline, and a risk management plan. Serve as account and project lead for multiple engagements. Identify and qualify opportunities, develop proposals, build and maintain relationships with clients and contractors, manage consultants and sub-contractors throughout engagements, and maintain overall project profitability. Develop sales and marketing collateral, including project success stories, nurture campaign materials, and web content. Foster internal knowledge sharing and collaboration among consultants. Led project to develop MicroStrategy BI dashboards on existing data models for the U.S. House of representatives office of the chief administrative officer (CAO). Demonstrated the capabilities of BI where it was underutilized. The dashboards provided better insights into member office spending and budgets and enabled the CAO to identify potential cost savings. Led project to assess and offer recommendations to improve the system performance of a MicroStrategy-based BI software product developed and resold to customers by a large 3rd party software/hardware firm for use with its ERP software. Summary : Ethical, well-rounded executive with a very strong record of success in services, operations, business development, and sales and marketing. Demonstrable record of increasing revenue while streamlining operations and creating win-win environments. Problem-solver that embraces challenges and change. High Performing operations - management executive with expertise in P&L management, safety management, contract management and customer service management. Oversee and promote safety culture and compliance in a region of 110 employees resulting in TRIR under 1 single region. Develop regions annual budget to include service strategy for extended years plans with accuracy of 3% variance. Developed regional support model used companywide increasing efficiency and revenue by 7 to 10% annually. Manage regions PL and ensure operational efficiency exceeding 38% cm goals annually. Develop and direct managerial teams alignment with company business goals equating to a successful region. Perform contract review and support for a business development team with over 60% proposal win rate. Ensure contract compliance at all locations via structured team meetings, team reviews, and individual training. Met or exceeded contractual availability obligations on 95.5% of contracts managed. Direct customer service excellence at all locations resulting in contract renewal and positive NPS score. Objective : Accomplished and high performing executive with deep expertise in the application of analytics, business intelligence, data mining, and statistics in multiple industries. Direct oversight and management of government and commercial service agreements across numerous clients both CONUS and OCONUS. 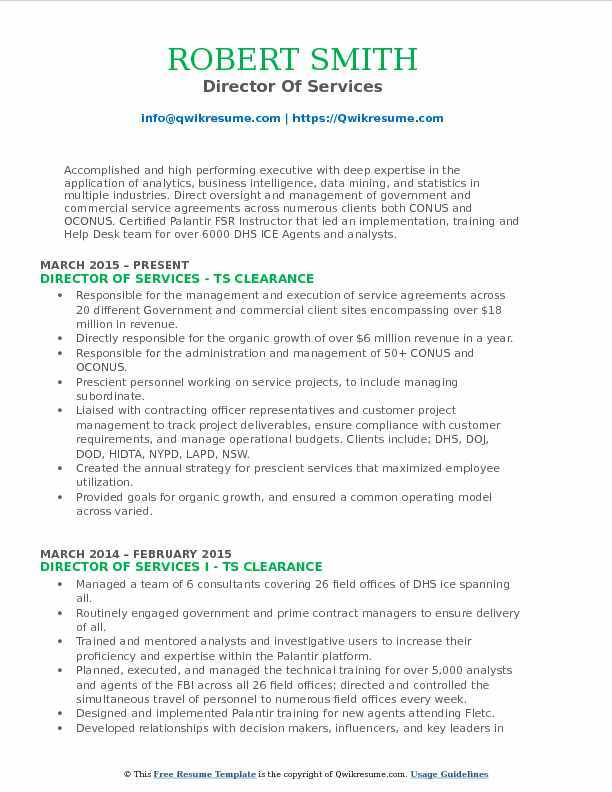 Certified Palantir FSR Instructor that led an implementation, training and Help Desk team for over 6000 DHS ICE Agents and analysts. Responsible for the management and execution of service agreements across 20 different Government and commercial client sites encompassing over $18 million in revenue. Directly responsible for the organic growth of over $6 million revenue in a year. Responsible for the administration and management of 50+ CONUS and OCONUS. Prescient personnel working on service projects, to include managing subordinate. Liaised with contracting officer representatives and customer project management to track project deliverables, ensure compliance with customer requirements, and manage operational budgets. Clients include; DHS, DOJ, DOD, HIDTA, NYPD, LAPD, NSW. Created the annual strategy for prescient services that maximized employee utilization. Provided goals for organic growth, and ensured a common operating model across varied. Facilitated diversification of customers and built a sustainable model for revenue and personnel. Centralized and standardized the filling of open positions, as well as provided input regarding personnel availability when seeking to secure new contracts. 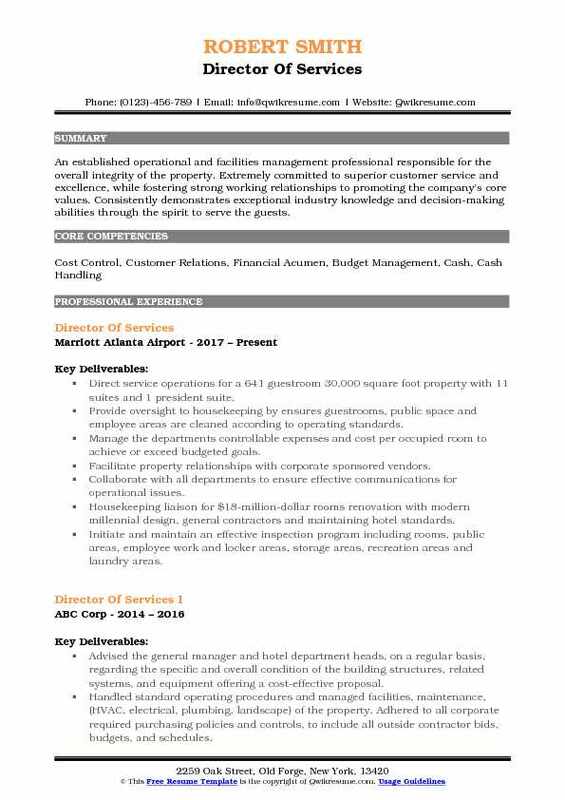 Objective : An established operational and facilities management professional responsible for the overall integrity of the property. Extremely committed to superior customer service and excellence, while fostering strong working relationships to promoting the company's core values. Consistently demonstrates exceptional industry knowledge and decision-making abilities through the spirit to serve the guests. Direct service operations for a 641 guestroom 30,000 square foot property with 11 suites and 1 president suite. Provide oversight to housekeeping by ensures guestrooms, public space and employee areas are cleaned according to operating standards. Manage the department's controllable expenses and cost per occupied room to achieve or exceed budgeted goals. Facilitate property relationships with corporate sponsored vendors. Collaborate with all departments to ensure effective communications for operational issues. Housekeeping liaison for $18-million-dollar rooms renovation with modern millennial design, general contractors and maintaining hotel standards. Initiate and maintain an effective inspection program including rooms, public areas, employee work and locker areas, storage areas, recreation areas and laundry areas. Oversee areas of operation to a $400k budget by reviewing operating statements, and budget worksheets. Manage 50 employees hours and wages to budget productivity and payroll progress reports. Summary : Dynamic hospitality leader with extensive, established record of excellence in full-service luxury Four and Five Diamond Hotel, Resort and Spa properties. Extensive experience with high-profile guests including service as hotel liaison with the personal assistant to Her Majesty, Queen Elizabeth II. Extensive knowledge of, and responsibility for Rooms Divisions budgets. Consistent record of improving guest satisfaction ratings. Managed the front and back of house aspects of the housekeeping, laundry, florist and villa management (butler/lifestyle) functions and colleagues to ensure all property accommodations, public space, and staff areas are clean and well maintained to agreed standard. Focused on providing intuitive, personalized service to continually improve guest, owner and staff experience and maximized the financial and service performance of the department. Kept the housekeeping and laundry teams focused on meeting and exceeding guest expectations and desired financial results. Responsible for the creation and maintenance (relevance, accuracy) of all departmental standard operating procedures (SOPs). Managed the flow and proper execution of standard operating procedures (SOPs) for the department. Ensured compliance with all department SOPs. Managed customer satisfaction -market metrics- program and complied with kor/viceroy policies in relation to reporting, trend analysis and resolution. Oversaw the laundry and uniform operation to manage costs and quality of hotel linen, guest and colleague laundering and dry-cleaning. Monitor implementation of energy conservation programs where applicable. Oversaw the compliance of Anguilla health safety regulations - including food handlers certification for lifestyle/butler service. Objective : Highly motivated, dynamic, accomplished leader with a proven record of success through internal growth within organizations. Committed to learning and teaching through innovation and creativity. Dedicated to optimizing potential within operations, while leading to profitability and success for owners and management. Skills : Organizational Planning & Strategy, P&L, Global Business Planning, New Product / Solution Development. Responsible for clinical and administrative operation of the regions case management services, residential treatment programs, MHSA and other funder contracts. Ensure program activities comply with contract expectations and other funder requirements. Supervise staff both directly and indirectly through intermediary supervisors. Participate as a member of the regional senior management team in the development and implementation of policies and programs. 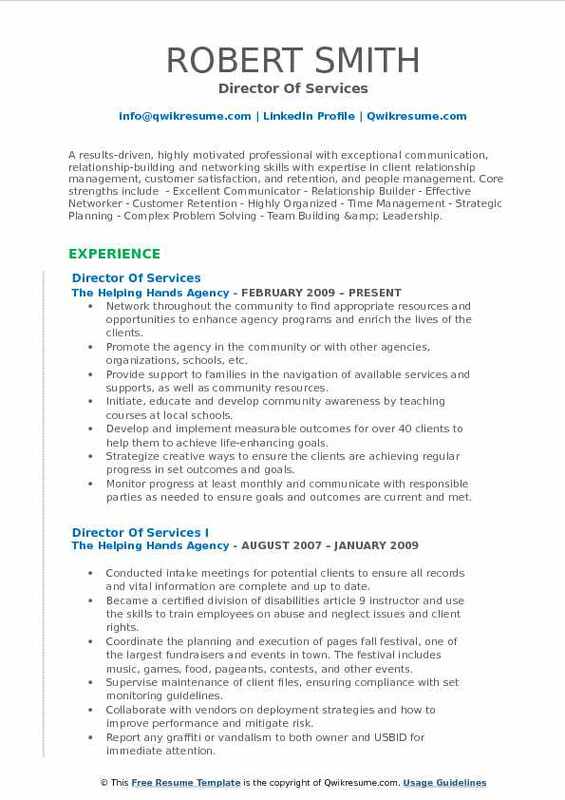 Recruit, hire, supervise and manage performance and terminate as necessary program staff. Act as a liaison with government agencies, the community and the public relative to funding, contracts, and delivery of services. 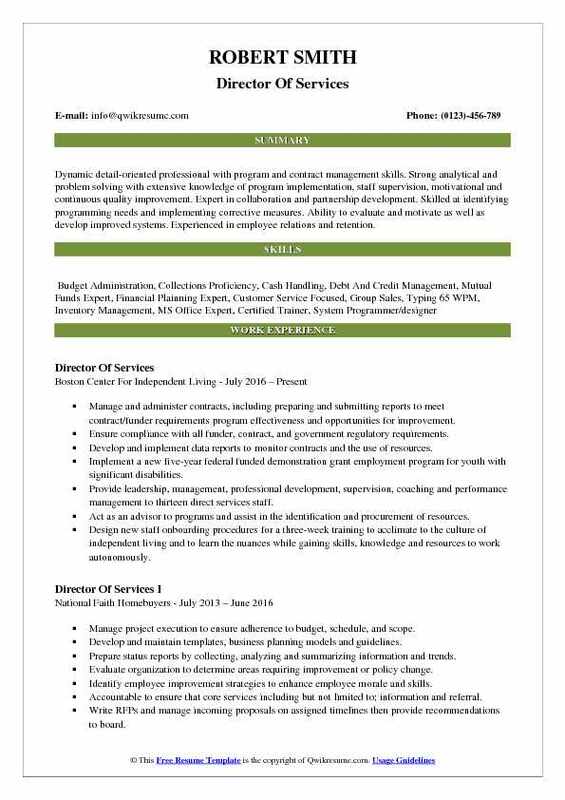 Assist in the development and on-going management of services and program budgets. Identify and correct program deficiencies and recommend system improvements. Ensure compliance with all applicable laws, regulations, and policies and procedures of the state departments of social service, mental health, and the county.